Pointed elf ears, a crooked witch nose, cruel devil horns or a mean-looking open wound. For live action role players or movies and the theater. 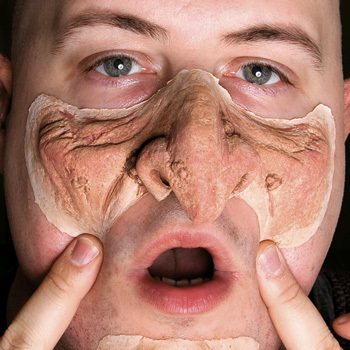 For Halloween or your theme party – our latex prosthetic pieces provide you with countless transformations. In just a few steps, you can achieve realistic results – over and over again! • What are maskworld prosthetic pieces made of? Our latex prosthetic pieces are made of high quality, 100% latex – a natural product – combined with a natural skin-colored pigment. Latex features extreme elasticity and durability. 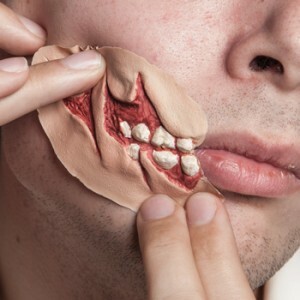 Due to these properties, our latex prosthetic pieces maintain their high level of wearing comfort and highly realistic appearance even when they are used frequently. The edges are made extra thin, which means maskworld prosthetic pieces have a practically seamless look. First, hold the prosthetic piece up to your face, to find the position and angle that gives you the look you want. Remember where you want it! Before applying the prosthetic piece, remove the oil from the skin in the area you plan to apply it to. Use Mastix remover or alcohol-based skin toner to do this. We recommend using Mastix spirit gum (a special resin used by the professionals) to apply the latex prosthetic piece to your skin. 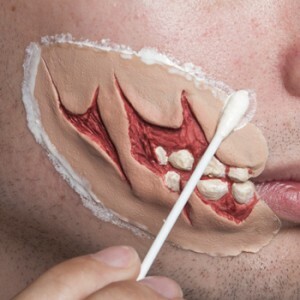 To do this, use a brush to apply the Mastix to the area of your skin where the edges of the prosthetic piece will go. Apply a thin, even coat. For a really firm hold, dab the Mastix on with a cotton bud. Allow the Mastix to dry until you can pull threads of it up with the cotton bud. 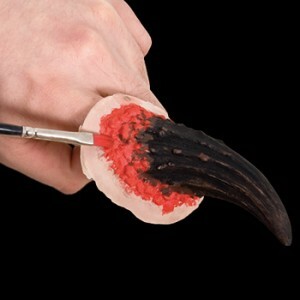 Now use your fingertips to press the latex prosthetic piece firmly to the Mastix on your skin. To create an even transition between the latex prosthetic piece and your skin, you can roll a brush handle along the thin latex edge. With warm, gentle air from the hair drier, you can dry the Mastix a bit faster. For larger prosthetic pieces (like our half masks), it often helps to apply another coat of spirit gum to the edges. The thin edges must be especially well adhered to make them as invisible as possible. - If you want to apply your latex prosthetic piece to a hairy part of your body, it pays to shave thoroughly before gluing. Removing latex from hair can be very painful. But wait a little before using Mastix on freshly shaved skin, which might be very sensitive. - When applying prosthetic pieces to the area around your mouth (= all noses, snouts and chin prosthetic pieces), keep your mouth slightly open so the latex prosthetic piece will move with your mouth when you speak later. First, slip the latex ears over your own ears and find out where to put them to get the look you want. If you need to, use a nail scissors to trim away some of the inner ear area to make the transition smoother. Apply a thin coat of Mastix spirit gum to your own ears, especially at the points where the latex ears end. 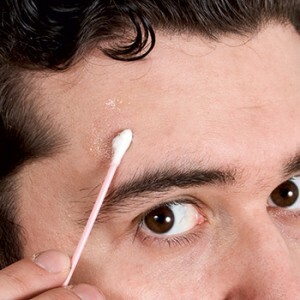 When the Mastix is almost dry and forms threads, slip the latex ear over your own ear and firmly press it to the contact points with your fingertips. Use a cotton bud dipped in Mastix remover or rubbing alcohol to remove any Mastix that may have emerged from beneath the latex edge. You can apply make-up to the transition between your skin and the latex prosthetic piece to make it practically invisible. Tip: If you have long hair, you can place a lock of hair in front of your ear to hide the transition. We have not cut out the nostrils of our latex noses – this makes it easier for you to adapt them to fit optimally. 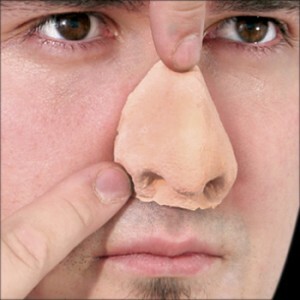 To do this, cut just enough latex out of the nostril section to allow you to breathe comfortably. Tip: Start with a small hole – you can always cut more away. Then try on your latex nose for size – at first, without the Mastix spirit gum. 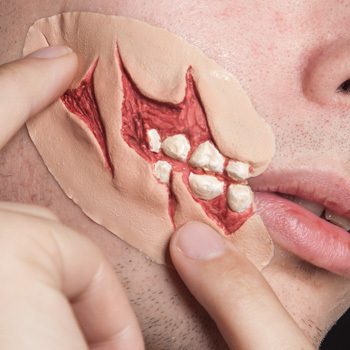 Remember where the perimeter of the latex prosthetic piece contacts your skin. 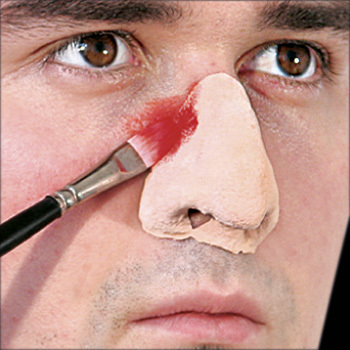 Now remove the nose, and spread a thin coat of Mastix on the skin where your latex nose will go. Dab at the Mastix with a cotton bud until it is dry enough to form threads. Now put the latex nose back on and press it lightly to the Mastix. Don’t press the edges firmly until you are sure that the latex nose is exactly where you want it to be. Use a cotton bud dipped in Mastix remover or rubbing alcohol to remove any Mastix that may have emerged from beneath the latex edge. 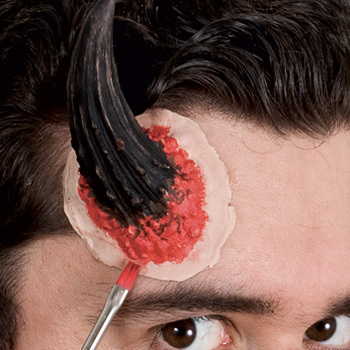 We recommend that you apply make-up to your latex horns before applying them to your face. Leave the gluing edge bare – this will make it easier to apply the horns. You can apply make-up to the edges later. First, hold the horns to your head and remember the position that you like the best. Now spread a thin coat of Mastix spirit gum onto the skin where the latex will contact it. Dab at the Mastix with a cotton bud until it is dry enough to form threads. Now put one horn after the other in place. Use your fingertips to firmly press it to the Mastix. Tip: Use Horror Skin, a liquid latex product, to create seamless transitions between the latex prosthetic piece and your own skin. - Make sure that you don’t get any Horror Skin on your clothes, carpet or other textiles, because it will not wash out. 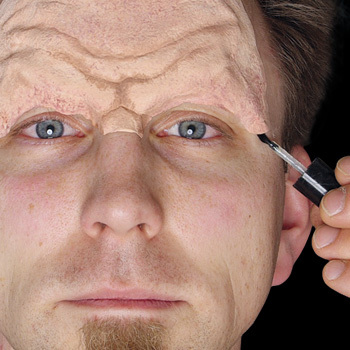 • What do I have to remember when applying make-up to latex prosthetic pieces? Tip: Remember to apply the make-up from the latex to the skin – this will prevent the edges from rolling up. 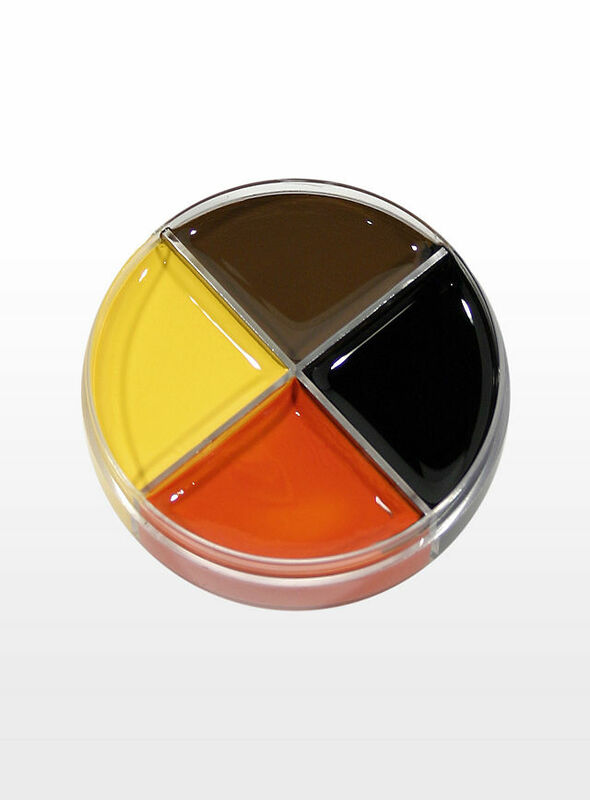 Our make-up colors are ideal for latex prosthetic pieces and skin. This is because they are oil-based make-up, which tends to stay in place on latex. However, you can also use the foundation make-up you have at home for a skin tone. We can’t really recommend using water-based make-up, because your skin breathes beneath the latex prosthetic piece. This could cause condensation, which would make water-based make-up bleed. Also remember to remove the make-up from your latex prosthetic pieces after you take them off. The oils from the make-up and your skin could start breaking down the latex. Tip: You can use Horror Skin, a liquid latex product, to create seamless transitions between the latex prosthetic piece and your own skin. Apply make-up to it as well! If you have used Mastix spirit gum to apply your latex prosthetic piece, simply use Mastix remover or rubbing alcohol to remove it. Use a cotton pad or bud to moisten the edges well. 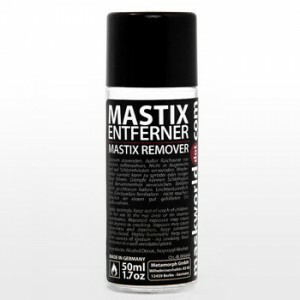 You can carefully use your fingernail to lift the edge enough to put Mastix remover underneath the latex. If this works, use a cotton bud to rub away the Mastix. 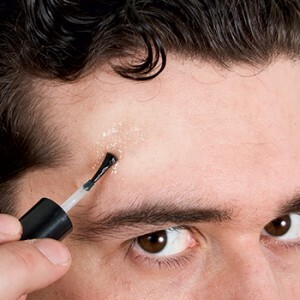 If you can’t lift the latex edge, wait until the Mastix remover has done its work. As soon as the bond is weak enough, carefully pull away the latex prosthetic piece. If some Mastix spirit gum is left on your face, remove it with Mastix remover or rubbing alcohol. Use lots of warm water and soap to remove the rest of the make-up from your face. • Can I reuse my latex prosthetic pieces? Yes, you can! Our latex prosthetic pieces were designed with multiple use in mind. 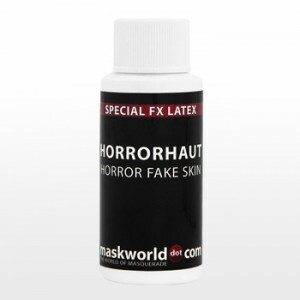 These latex prosthetic pieces from maskworld.com are hand crafted, using a method preferred by professional make-up artists Latex features extreme elasticity and durability. These properties allow latex prosthetic pieces to be re-used frequently if they are properly cared for (see care instructions below). 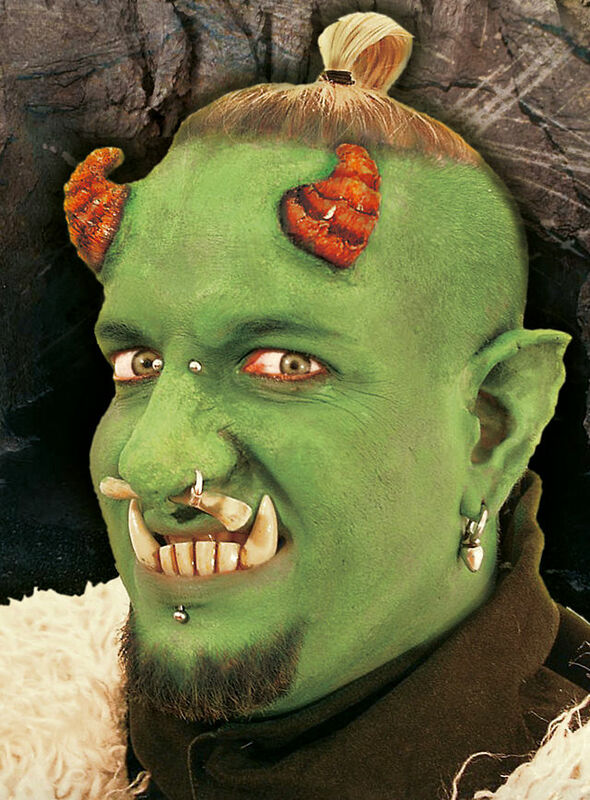 When Mastix spirit gum or make-up is included with your horns, ears, scar or wound, it comes in a container that can be closed. Be sure to close the containers tightly, so the contents does not dry out. • What is the right way to clean the latex prosthetic pieces? Do I have to care for them in a special way? 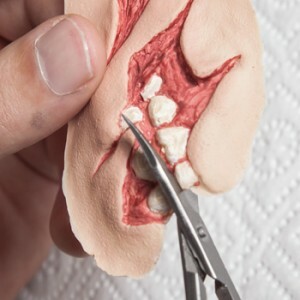 It’s worth it to care for your latex prosthetic pieces properly – if you do, you can use them over and over again. As soon as you have removed your latex prosthetic piece after wearing it, clean it thoroughly to remove all of the make-up and spirit gum. To do this, use Mastix remover or some rubbing alcohol on the spirit gum, and warm water and soap for the make-up. Carefully dry your latex prosthetic pieces after cleaning. Before storing them, sprinkle some talcum powder on your latex prosthetic pieces (to keep them supple) or spray them with silicone spray (to protect them against moisture). This will preserve your horns, ears, wounds, scar, etc. for realistic transformation results – every time. • How and where should I store my latex prosthetic piece? We recommend storing your latex prosthetic piece in a dark, dry place. Our latex products required protection against frost, moisture, extreme heat, and direct sunlight when they are in storage. The packaging they come in is re-usable, and can also be used for storage. • How skin-compatible are the latex prosthetic pieces? As a rule, our make-up products are highly skin-compatible and comply with the EU Regulation on Cosmetic Products. In rare individual cases, they may cause reddening of the skin, which becomes visible after removal. Do not use Mastix spirit gum on skin that has just been shaved, since freshly shaved skin is sensitive and more easily irritated. In case of doubt or if you have sensitive skin, test the Mastix spirit gum and our make-up on an inconspicuous part of your body (your wrist, behind your ear, etc.). Attention: If you are allergic to latex, you cannot use our latex prosthetic pieces, since they are all made of 100% latex. Here’s to your perfect transformation!